Always soak and wash your clay pot before the first use. Completely submerge and soak the clay pot and lid overnight. Do this in the kitchen sink. Then scrub the pot and lid with a brush under water to remove any clay dust. Some say to use a stiff brush for cleaning. But if your clay pot is glazed and has a smooth surface, a stiff brush can scratch your pot. If you have a Chinese clay pot (i.e. a sand pot, 砂煲), it should also be seasoned before the first use after it is soaked and washed. Simply make a porridge by filling the pot with water to about 70%. Add cooked rice that is about 1/5 of the water’s volume and mix well. Wipe dry the pot’s bottom and cook over low heat with the lid on for the first 10 minutes. Then slowly increase the heat to a medium-low and cook for another 15 minutes, or until the liquid begins to simmer. Remove the lid and bring down the heat. Continue simmering over low heat without the lid until the liquid turns into a porridge (or a paste). Turn off the heat and let the porridge cool and rest with the clay pot for an hour. Discard the porridge. Rinse the pot with water and let dry upside down tilted at an angle so that air can circulate through the cavities. This seasoning process fills in the microscopic holes or any hairline cracks in the pot. After the first use, an unglazed clay pot should still be soaked in water for about 10-15 minutes before use. Just wipe dry the pot bottom and side before putting it on the stove. Although Asian clay pots can be used above fire on a gas stove, sudden temperature change should be avoided as it will crack the pot. Always begin cooking by warming up a soaked pot with low heat for the first 5 minutes. Then the heat can be slowly adjusted up to a medium-low to medium heat. Avoid using high heat with a clay pot to prevent cracking. If cracks begin to form in the inside of the clay pot, season it again by following the steps in the second bullet point above. Clean the clay pot only after it has cooled. Soak it with water and clean with a brush. If you need something stronger, add some baking soda as a scouring agent and degreaser. Do not use detergent since clay is a porous material and will soak up the soap. I would not put a clay pot in a dishwasher either. The high temperature and detergent can damage the clay pot. If moldy smells develop in your clay pot, submerge it in hot water and add 3 tablespoons of baking soda for every 1 quart of water. Let it soak for a while before rinsing and seasoning it again. To remove food smells absorbed into the clay, fill the pot about 75% full with water. Simmer with a teaspoon of green tea leaves for 10 minutes. Always put a hot clay pot on a cloth pot-holder or towel. Never put a hot clay pot on a cold or wet surface, as the temperature shock will crack the clay. If you plan to bake with the clay pot, remember to always put the pot into a cold oven that has not been preheated. Again, you want the clay pot to warm up gradually with the oven temperature. Following these steps and the manufacturer’s instructions should help you keep your clay pot in good shape and long lasting. If you have never owned a clay pot before, don’t lose confidence. You can always start with a smaller, less expensive pot first. When you get the hang of things, graduate up to a higher quality, larger pot. Although I must say that the largest clay pot I’ve been able to find in the US is only about 6 quarts (not as big as I’d like to make soups). If you know of a place where I can get a larger quality clay pot (8+ quarts) made in Japan, Taiwan, or US, let me know by leaving a comment below. And thanks in advance! Is a Flat Grain or End Grain Cutting Board Better? I bought my first clay pot this weekend at the chinese grocer (Oriental supermarket Markham 1661 Denison St. unit 2 Markham On L3R 6E3t tel: 905-513-1666) for $20cad on sale. They have lots. It holds a little over 9 liters. It is branded MyLand. I have yet to test it for lead as I learned of the test only now on your site. Hi Rick. Thank you for visiting this site today and sharing where you bought your clay pot! I appreciate the link too. The design (shape) is pretty much what I was looking for to make soup. I am glad you were able to find a big size, and at such a great deal on sale! Since the writing of this post, I was able to find a brown colored 8qt ceramic clay pot made in Taiwan. It is lead-free, at least according to my at-home lead testing. But I definitely like your link reference and will keep it in mind if I need a new or replacement clay pot. Thanks again Rick! Hi Sharon, it tested negative for lead. Hi Rick, thank you so much for reporting back your lead test result! I am so glad to hear that the cookware tested negative for lead in your at-home test. 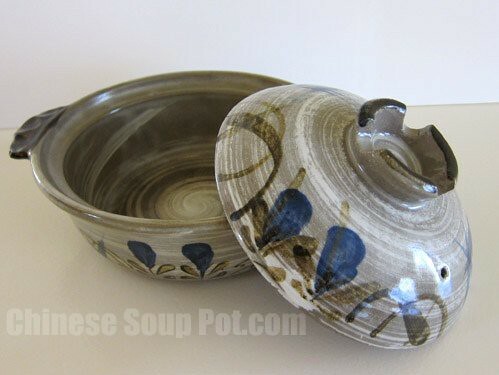 This is also really good information for other readers who are looking for a clay pot. Thank you so much again for your wonderful contribution to this post! I hope you will find recipes you like here to use with your new clay pot! And happy holidays to you! I read online that a glazed pot isn’t as good as unglazed, and loses some of the health and taste benefits… Is this true? I’m really confused, please help! I actually already have ordered a pot, and I regret it after reading your helpful article… when it comes, I think I might return it. Do you have any specific suggestions where I should get it from if I do return it? Hi Ana, thank you very much for visiting this site and for submitting a question! Using a glazed or an unglazed clay pot is a personal choice. I do find that the unglazed Chinese sandpots tend to make food come out tastier (probably because they are more porous and allow better air circulation during the cooking process). These sandpots are cheaper also. However, the drawback with this type of pot (at least for me) is that they tend to mold easier. If you buy this type of pot, try storing it without the lid covering the opening to allow the inside to continually air. Perhaps this will reduce mold formation. For many years now, I’ve been using the glazed clay pots made in Japan or Taiwan. I find that these glazed clay pots are a little more resistant to cracking during temperature changes. Although I advice readers to put claypots through gradual temperature changes, I have taken my chilled glazed clay pots directly from the refrigerator to the microwave for heating. (shame on me, I know! =P) And luckily, they did not crack. Which ever type of clay pot you end up choosing, I think you will enjoy cooking with it. There are pros and cons with each type, so it depends on what qualities are the most important to you. Rick provided a link in his comment above for a specific clay pot which you can check out. Amazon also sells a variety of clay pots. The nice thing with Amazon is that you can see other buyers’ product review before buying. Good luck! Do I also need to soak this pot, and then season it by putting in cooked rice to boil before its first use? What is the purpose of soaking it and seasoning it, is it crucial to do so, and what if I missed doing this? If I missed doing these steps before its first use, can I still do so after that? Can I use normal dishwashing detergent to wash this? Looking forward to your reply, as I need to start using the pot soon… Thanks a lot. Hi Sharon, please allow me to ask a few more questions. I have been browsing websites on clay pot and found that like yours, some have advised against using detergent to wash clay pots. I am not used to the idea of not washing the pot with dishwashing detergent… Is it really clean to just use baking soda to wash it? And should I just wash using baking soda alone even if the clay pot has been used to cook savory dish which would cause it to be be oily and dirty after use? Would it compromise on the cleanliness and hygiene of the pot if I do not wash it with detergent after using it? Please pardon me for my ignorance… What exactly is baking soda, and where are they usually sold? Are they usually found in the baking section of grocery shops? Is it in powdery form? Coming back to the particular pot for brewing Chinese herbal medicine which I just bought recently (please see the picture in the link I had appended in my earlier post), I am not sure whether it is considered a clay pot or a ceramics pot… do you know…? And would the same procedures for caring it as shared in your this web page apply to it as well? Sorry I have asked so many questions! But I am feeling quite overwhelmed as I never knew that there is so much to take note and do when it comes to proper usage of clay pots. Would be grateful for your advice. Many thanks. Thank you very much for visiting this site, and for your wonderful questions! About the pre-use soaking and seasoning, this is a general recommendation to prolong the clay pot’s life. The seasoning is more applicable for the unglazed clay pots (I noticed that the picture from the link you provided has a glossy glaze). If the manufacturer of the clay pot you purchased from has any pre-use or maintenance instructions, definitely follow those directions. If you have already used the pot, you can still soak / season the pot. But I like doing this before my first use to double up as a pre-use cleaning step. About the cleaning of clay pots, baking soda is a good cleaning agent that does not scratch the clay surface. It deodorizes and cleans away light grease. Baking soda is a white powder that actually has many uses and are very inexpensive. I would try with cleaning with the baking soda to see if it takes away the grease. If you have to use a dish washing detergent to cut heavy grease, I would not let the clay cookware soak in it too long. I hope this helps! And enjoy using your new clay cookware!
. Health Disclaimer | Privacy | Disclosure Policy | Sitemap | Links copyright © 2010 - 2019 Chinese Soup Pot All rights reserved.